Lack of a readme (DAZ for goodness sake PLEASE include readmes! It's a freaking PITA not to know how to use something and so much work to find the REQUIRED documentation and get it... you'd think you don't want customers to be able to use the products they buy!!) and lack of know-how. from BotGen_Quik_LAnkle to BotGen_Quik_RShldr, it gets an error and tells me to check the log for details. Looked in log and even the log says "look in log for more details" and when the log says that..... EEK? Error reading file, see log for more details. Lastly, why is the bot skin under clothes??? I expect it under character, not clothing. Looked and looked and looked before I found it! Are you loading from the DAZ Content library? I installed in My Library just like any other DAZ installer..
Yeah i installed it... I didn't know where to find everything, nor how to use it... i guess i have to apply the v4 texture to all the bot figures individually. And I wish there were partial mats. For example if i load a human skin, i'd like to also use the bot eyes but no way o apply them alone, so I had to make my own mat. Kind of surprised at the lacking, though. And again, seriously, Daz should include the readmes. Pain....in....the.... REAR!!!!! 2. Apply the BotGen_All preset to apply all of the clothing materials. edited: removed "EXCEPT THE HANDS". You can download a PDF version by clicking the link at the top right. Go to the surfaces pane and select the surfaces you want to affect (for instance cornea, sclera, iris, pupil for eye). Hold down the key and double-click the mat pose you want to apply. Choose 'Selected' from the 'Surfaces' options and click 'Accept'. Very helpful all of you! I am also slightly disappointed in this set so far. In the promo screenshots they show a picture of a genesis woman with robot parts and seam lines making it look as if the robot is wearing a human face or key human parts. This is the effect that sold me on the purchase but it is really frustrating that this doesn't seem to be anything simple to do. @Lindsey...why would we need to load a v4 preset on an add-on that is supposed to be for Genesis figures? This makes no sense imho. I also do not see the Bot Genesis Parented Props anywhere to be used separately at my discretion. I also can not seem to use any Genesis clothing once this set is applied. Another real disappointment. So here is a sample of what I end up with if I simply apply to bot genesis preset to my figure. I would love to know what I am doing wrong and how to emulate the promo shots with clothing. you have to select the genesis bot parts and apply the v4 textures to them, not just to genesis. the bot parts are basically like geografted clothing it seems. Yes, if you look in the Scene or Surfaces tab, you should see a bunch of Bot_Gen figures. They are setup to accept V4 texture preset to remove the silver shader on both ends of the "bot joints". Just select all of them and apply a V4 preset. Thank you for these tips. So that definitely allowed me to skin the figure properly. Now I just need to experiment with some of the other figure types. I would like to be able to make different types of bots using the many V5/M5 types that I have. re: V5/M5 textures.. Bot-Genesis clothing figures only supports the default Genesis UV Set which is V4. So the more I play with Bot Genesis (working on a sci-fi project) the more frustrated I become with it. It is pretty much impossible to use any of the V5/S5 or other Genesis (V5/M5) characters effectively. Using V4 as a base is not ideal to me and the title of this product is thus very misleading. I already have another bot/cyborg product for v4/m4 and only purchased this item so that I could do more with Genesis characters. 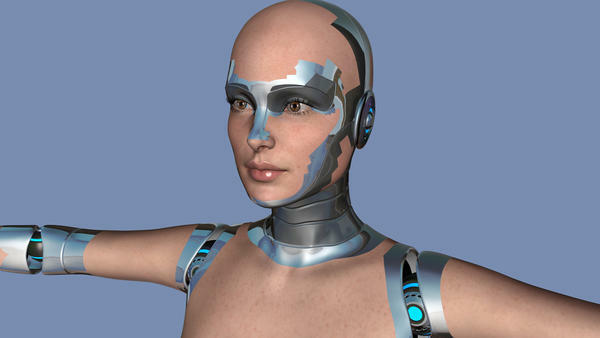 I can not effectively use any of the Stephanie character skins for my creations for example, such as Keira/Candance which means that my beautiful Sci-Fi utopia is only capable of populating Caucasian V4 women. Pretty lame. At this point my review of Bot for Genesis would be 6/10 at best. I do not feel this product was ready for sale to be honest. I think the concept is great. I think that the joint creation and chrome maps are fantastic. But don't expect to be able to do much more than create lots of chrome/Caucasian v4 based robots. Here is hoping for an update to fix this product. Colour me confused. There are far more skins for the V4 UV map than there are for V5 or S5, including many ethnic options. In fact, for ethnic options, I suspect you have FAR more V4 UV options. Being for Genesis, you can use any Genesis shape you want, which is the real strength of Bot Genesis. The red marks are what I am not liking not the red marks they are just me outlining the bad pokethrough which happens with loads of poses for genesis I like the Bot for Genesis but It could have been tested a lot more with poses I guess. I too have experienced the poke through issues on several poses. Some I have been able to fix using the morph adjustments for the joints but not all of them. As for the tone/skin spectrum for v4, I started using DAZ only in November and have not purchased all the V4 character options (only base v4/m4 bundles) because I felt that it would only be a matter of time before most sets were migrated (as evidenced by the new release of the Freak 5) I suppose your argument is valid, but I do feel that naming the product "Bot for Genesis" sets a certain expectation (and is a bit misleading) for potential buyers and users. If it was intended to only work for Victoria 4 UV maps then it should not be labeled for "Genesis"
I would also add that on many of the genesis body types, even when using v4 skins, I have encountered seam tears on the scalp, legs and arms so the chrome shows through which is not ideal. So I still believe that this product should still be in beta. I've had the same thing happen - easiest way to fix it I've found is to click on the joint object and shift it using the xyz motion parameters so it fits better. The problem seems to be because of the joint bend fixing product I use, which gets rid of the skin bulges and creases nicely but doesn't move the Bot joint objects, so they tend to intersect the skin at times. Although I don't think Alfaseed's work can be faulted, I wouldn't actually say that that set is better its a completly different style to begin with and I don't know if it will autofit at all well. I really like this set and don't regret purchasing it at all. 110.1 is a great outfit (and I've used it a number of times), but as scorpio64dragon states, it's a completely different style. They each have their place. 110.1 also only semi-works with Genesis after conversion. Bot Genesis is okay. I just think it looks a little cartoonish. I like the look of the Alfaseed model better. Is anyone else having problems uninstalling bot genesis? The uninstaller freezes. Is there a way to go directly to registery or some other way to manually uninstall? ANY advice at this point would be helpful. It may not have installed correctly the first time, or the uninstaller may be corrupted in some way. What I usually do, is reinstall the item, and make sure that I request an uninstaller, then try that. If you reinstall to the same place, exactly the same files will be installed again, and this time the uninstaller may work. Thanks, I think that did it for me! i don't get why, if the bot was created for Genesis, it ONLY takes V4 textures, and not genesis/V5 etc. Is the face texture from the Bot? I can think of two good reasons, first one is Genesis comes with a V4 UV so everybody has that set, and you need to buy V5 to get the UVs for it, and not every DS4 user has been suckered into buying the over priced low quality garbage DAZ are passing off as Gen 5. Second is the sheer amount of work involved in redoing the UVs on the skin sections, which would mean you would be paying a lot more for it than you are just to cover the extra work.